Have a wonderful - relaxing, refreshing - Labor Day weekend! Make chocolate chip cookie dough: In a medium-size mixing bowl, stir the butter and sugar together until smooth (give it some time and make sure it fully incorporates into a thick, smooth paste). Stir in the flour, then vanilla and chocolate chips (also nuts, if using). Form the dough into a disk about 1/2 inch thick (if the dough is very soft at first, chill it in the refrigerator for a few minutes), wrap with plastic wrap and refrigerator until firm. Once chilled and firm, unwrap disk and chop dough into bite-size pieces. Store in the freezer until ready to use in the ice cream. You can make this ahead, storing the tightly wrapped dough in the refrigerator for up to 5 days or in the freezer up to 2 months. 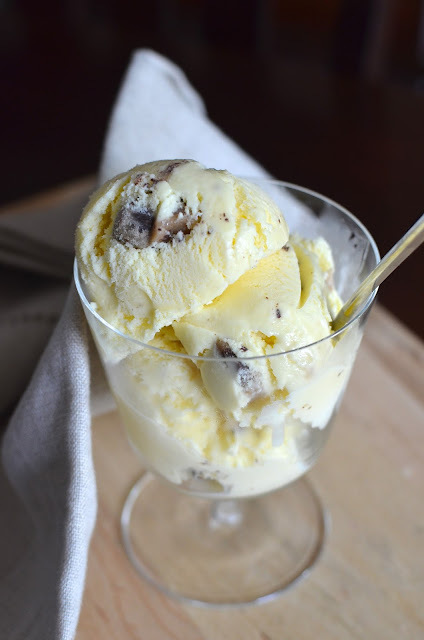 Make ice cream/gelato base: In a large saucepan, heat milk and cream over medium-low heat, stirring occasionally, until bubbles begin to form at the edges. In a medium size heat-proof bowl, whisk the egg yolks together. Then, whisk the sugar into the yolks until the mixture thickens and looks pale yellow in color. Temper the egg yolks by slowly adding some of hot cream and milk mixture into the yolks while whisking continuously. Scrape the custard into the saucepan and cook over low heat, stirring continuously with a wooden spoon or rubber spatula, until the custard is thick enough to coat the back of the spoon. It should reach a temperature near 185 degrees. Strain the mixture through a fine-mesh sieve into a large bowl. Stir in vanilla extract. Let cool to room temperature, then refrigerate overnight or until the custard is very cold. Churn the custard in the ice cream maker as per manufacturer's instructions. Fold in the pieces of chocolate chip cookie dough as you remove it from the machine. Freeze ice cream a few hours, preferably overnight, before serving. 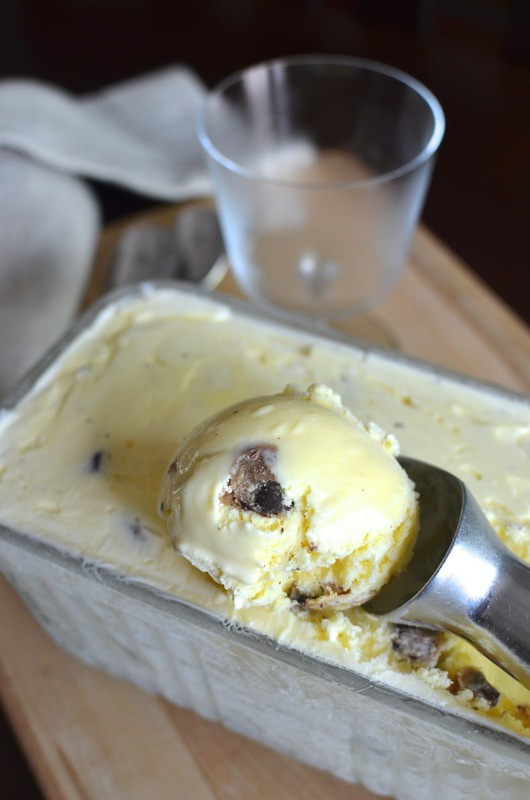 * If cookie dough isn't your thing, how about Cookies 'n Cream ice cream? For that, make the ice cream base above, omitting the vanilla extract. Coarsely chop about a dozen Oreo cookies. As you layer the churned ice cream into a storage container, scatter cookies in between in alternating layers, starting and ending with ice cream. Update...Here's the cookies 'n cream ice cream! Summer is long gone over here :-(( This weekend the temp. will drop to 15C and at night it's just 2C..that's great looking ice cream. The addition of choco. cookie dough is just brilliant. The AC is working hard this summer! That's for sure! Okay, i OBVIOUSLY need to make this before summer is officially over! Not that that will stop me from eating it well into fall. This is my favorite flavor! So many people's favorite flavor! : ) Let's not stop the ice cream celebration, ever! I never grew up baking/being tempted by cake batter so the idea has always been kind of foreign to me. I better not try in case there's no going back! Yum!! David Lebovitz's ice creams are always killer. The summer isn't over yet, so please do make more ice cream while the weather is still hot! (: Cookies n' cream sounds delicious. Cookies n' cream ready to be scooped this afternoon, my friend. We love ice cream all year long but it's always such a nice treat when the weather is warm :) It's still really hot here so I am definitely craving another batch. 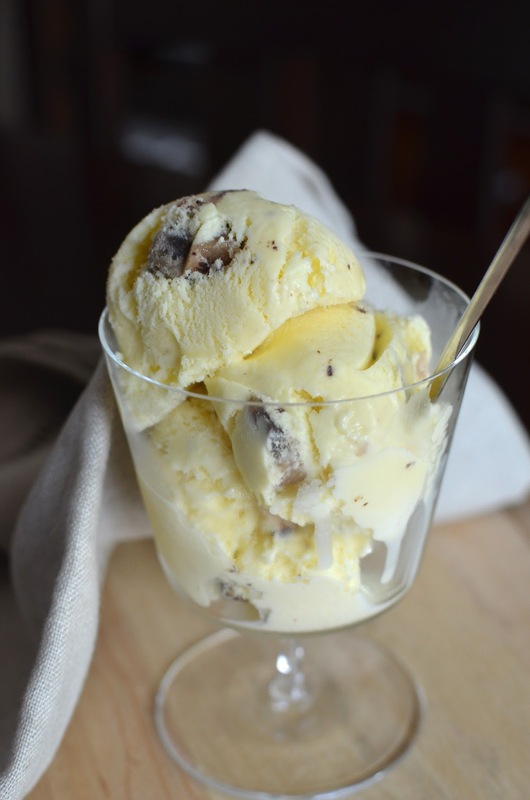 My husband and son love cookie dough ice cream so I seriously need to try making this for them soon. It looks perfect for this long weekend! Hope you guys have a great one! Kelly - it has been a dry, HOT summer. I'm not complaining but that might be one of my excuses for so much ice cream making this year! Hope you are enjoying this coming long weekend! Talk soon! Hi Monica, I know I just can't believe that this summer is almost over.......and this is the perfect way to celebrate. Though I am one of those people that love ice cream in the rain. I think of it as a quintessential American ice cream flavor, too. : ) Hope your kitchen is up and running soon. You will be doing a whirlwind of cooking and baking for sure! It'll be lovely. Lots of ice cream going on here. Have a great weekend! OMG, those cookie dough chunks! Swoon-worthy! CCCD ice cream might be my favourite ice cream flavour ever, so I am totally hopping on this bandwagon. Yum! I'm happy to hop on any ice cream bandwagons, too! Thanks, Amanda. We are on a crazy heat wave this week, it's just too much. We ate cold stuff all the time. I need this icecream in our mix. Looks amazing Monica. The kids would love the chunks in it, just like their mumma. Love making icecream, looks so good. We're finally getting a break in this heat! Can't complain. Thanks for stopping by!